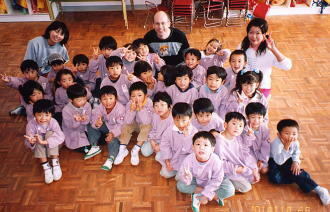 My November 2001 trip to Japan included visits to 11 elementary schools and 2 kindergartens. These schools are located in 7 different prefectures: Aichi, Kanagawa, Miyagi, Nagano, Yamagata, Yamaguchi, and Yamanashi. Some schools are in large cities such as Nagoya and Kawasaki, and others are in small towns and villages such as Azumi Village in Nagano with 2,500 residents. Azumi's combined elementary and junior high school has about 100 students, in contrast to several larger schools I visited where one grade has 100 or more students. On this page I give some of my general impressions and thoughts about the entire three-week trip. Each school visit also has a separate web page with photos and comments (page with links to individual school visits). Planning the Trip - My company implemented a huge new computer system in August, so I worked many long hours (including almost every weekend) between May and October. I could not take any vacation during the summer, so my wife Noriko went to Japan for three weeks during June and July since she had to take her vacation when the school where she worked was not in session. I decided to also go to Japan when I could finally get some time off from work in November. Warm Welcomes - I was surprised by the warm welcome I received at each school. Even though nobody at the schools had ever met me before or even seen a photo of what I look like, the principals, teachers, and students at the 13 schools all treated me kindly as a special visitor. I had written to the schools that I would like to talk with the students about American culture, geography, and English, but I did not give any specifics about the talks. The schools were very open and trusting to let me speak to their students, even though they did not know what I might say or how much Japanese I knew. Preparation and Organization - The principals and teachers at the schools did much planning to set up schedules and to prepare activities for my visits. The schools had detail written schedules with times, places, and activities. My activities varied greatly from school to school since I did not specify beforehand exactly what I wanted to do during my visits. Each visit turned out to be very special and memorable in its own way. Three of the smaller schools had every grade actively involved in my visit, which really astonished me. Saigo Elementary School in Toyohashi City had assigned individual tasks to about 15 different people (probably the entire school staff). Actually, this was the one school where I started to think in the morning of my planned visit that maybe the school had forgotten that I was coming since the plans had been made so long ago and since I had never received directions on how to get to the school. So I was astounded to find out when I arrived at the school how much advance preparation had been done for my one-day visit. Special Presentations - The students at many of the schools prepared special presentations or performances for my visits. The children sang songs or played music on recorders to welcome me to the school. Students at three elementary schools performed traditional Japanese dances, and the third graders at Monou Elementary School did an energetic taiko drum performance when I arrived at the school. Several schools had performances related to the Blue-eyed Dolls. One of the sixth-grade classes at Daiju Elementary School in Yamagata City wrote the script of a play called "Helen's Story - Toward a Peaceful Tomorrow." This play included two songs with the lyrics and music also composed by the sixth graders. On the morning of my visit, this class of sixth graders performed the play at an assembly attended by all of the school's nearly 600 students. The sixth-grade class at Azumi Elementary School sang a beautiful rendition of "Blue-eyed Doll" at a school assembly. The sixth graders at Daiichi Elementary School in Yamagata City showed me a video of the play that the class had performed at a school assembly less than one week before my visit. The play showed what it was like to live during World War II, and it contained some parts about the school's Blue-eyed Doll. Wide Range of Ages - During my travels in Japan I had the opportunity to meet people of many different age groups. The Friendship Dolls appeal to people of every age, from young children to elderly people. The opportunity to get to know and be friends with people of all different ages is one of the main reasons I enjoy so much working on my Friendship Dolls web site. During my visits to the two kindergartens, I met many children from ages two to five. Conversation with this age group was by far the hardest for me, since I many times had difficulties understanding what the young children were trying to say. But we still had fun together! During my visits to the 11 elementary schools, I enjoyed meeting students from first grade to sixth grade, giving talks to them, and answering their questions. Surprisingly, as part of my travels in Japan related to the Friendship Dolls, I met several "retired" people in their late 50s, 60s, 70s, and even 80s. These people are actively involved with the Friendship Dolls in many ways: making new dolls, organizing activities for children, creating presentation materials, writing books, performing historical research, and searching for missing Blue-eyed Dolls sent by America in 1927. One activity I did not observe in the age group was "making web pages" (or even "getting information from the Internet"), so maybe widespread use of the Internet by retired people in Japan is still a few years away. Student Questions - Answering questions from students was always fun, since I never knew what to expect. One little boy at a kindergarten asked me whether I had a girlfriend. I had just given a talk at a school assembly where I told the children I have a wife who is Japanese, so I was thinking maybe he missed that part of the talk. Well, then again, maybe he was listening to that part. I decided to give the safe answer of repeating that I had a Japanese wife. Some student questions stumped me. Since I live in Connecticut, one student asked a natural question: "What are the famous products of Connecticut?" Not having grown up in Connecticut, I had a hard time thinking of anything "famous" about the state other than it is the place between New York City and Boston. I thought for a few seconds and came up with the uninspired answer that Connecticut has a famous aquarium, many banks and insurance companies, and one of the most famous universities in America. The students in the class were not impressed. The students at several schools prepared questions before I arrived, and many hands shot up when after my talks I asked whether anyone had a question. The sixth graders at Yamagata City Daiichi Elementary School and the first and second graders at Monou Elementary School in Miyagi Prefecture had many detailed questions about the Friendship Dolls. Some of these questions related to Blue-eyed Dolls in Yamagata or Miyagi Prefectures, so a local resident who accompanied me was able to answer these questions. Several children, especially those in the sixth grade, asked questions about the recent terrorist incidents in the United States. I explained that many Americans feared anthrax contamination and another terrorist incident. Many people have decided not to fly since September, and airports and companies have greatly increased security. When talking with some of the sixth-grade students at Yamagata City Daiju Elementary School, a couple of students asked my opinion on the war in Afghanistan. My response in class to this important but difficult question did not take into consideration (a) the age and background of the students and (b) my limited Japanese to explain in detail the reasons for my opinions on this complex topic. When I told the students that I thought that the United States must try to kill Osama bin Laden (thinking to myself that he would not let himself be captured alive), they were somewhat shocked, considering my limited explanation that bin Laden wanted to kill Americans and their allies, so the US had no choice in the matter. Recognizing immediately that my words probably sounded to the students quite inconsistent with the message of peace of the Friendship Dolls, when I returned to the US I sent to the students an e-mail with (a) an apology for my inadequate answer in class and (b) a much more detailed explanation of my views against violence and war except in very rare circumstances. Before my November 2001 trip to Japan, I had never visited a Japanese elementary school or kindergarten, so I learned an immense amount from my visits to the 13 Japanese schools. Most of all, I learned from my comments on the war in Afghanistan that when answering questions I need to carefully consider the age and background of the students and to fully explain myself on issues considered to be controversial. Material for Web Site - I received a tremendous amount of Friendship Doll material from the schools I visited and from the Miyagi Blue-eyed Doll Study Group, Koneta Friendship Doll Group, and Urayasu Friendship Doll Exchange Association. In the future I hope to add some of this interesting material to the Friendship Dolls web site. The material included newspaper articles from 1927, historical photos, books, articles about finding a school's doll, pamphlets, recent photos, and play scripts. Yamagata City Daiichi Elementary School gave me a bound children's book about their two dolls Mary and Eileen and the other Blue-eyed Dolls in Yamagata. Saigo Elementary School in Toyohashi City presented me with a pamphlet in both Japanese and English that gives the story of their doll Koneta and the two Koneta replicas. Continuing Friendships - As I left some schools, several students asked me to please come again. I was very happy when I heard these words, but I also felt a little sad when I thought how difficult it would be to return before they graduated. I sincerely hope to continue friendships with the students and teachers at the schools I visited, although it most likely will be through letters, e-mails, and postcards rather than in person.